This is what Simon, a cyclist and engineer from Ireland, imagined and he brought the bike to life. His brainchild, the LittleBig, is a 3-in-1 bicycle that converts from a little balance bike to a big balance bike to a pedal bike. 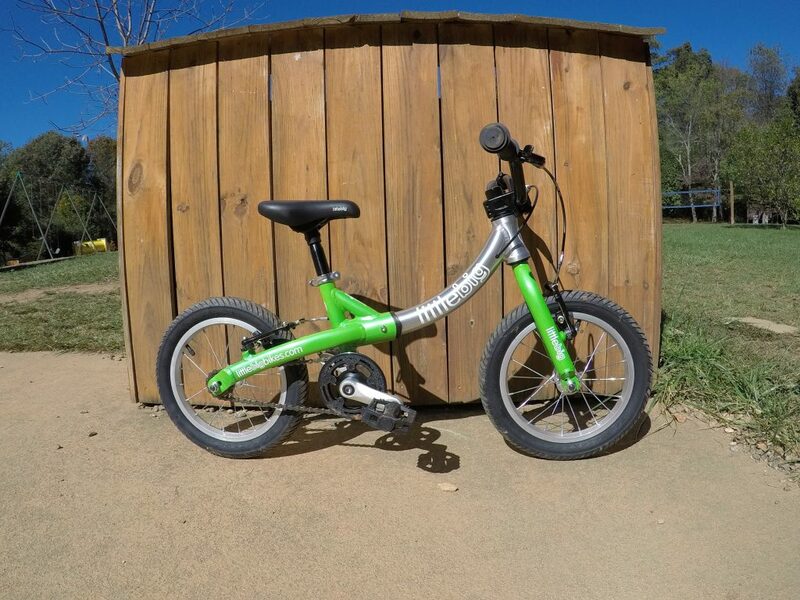 The rear end of the little big bike is able to “flip” in order to grow with your child. This allows it to go from little balance bike to big balance bike (or big pedal bike). The conversion itself is easy. There are two bolts to loosen, you flip the frame, and then retighten the bolts. The seat post also has to be removed and flipped to the other side of the frame, but this is made easy thanks to a quick release seat collar. The whole thing takes about 5 minutes. The conversion to pedal bike is also easy. The pedal/bottom-bracket combo attaches to the bottom of the frame. There is also a 1″ spacer above the stem which allows the handlebars to raise and adds in the comfort level of your child as they grow. To see the whole conversion from balance bike to pedal bike, watch our video review above. From first glance, it’s clear that the LittleBig isn’t just a toy–it is a real bike with all the bells and whistles to boot. 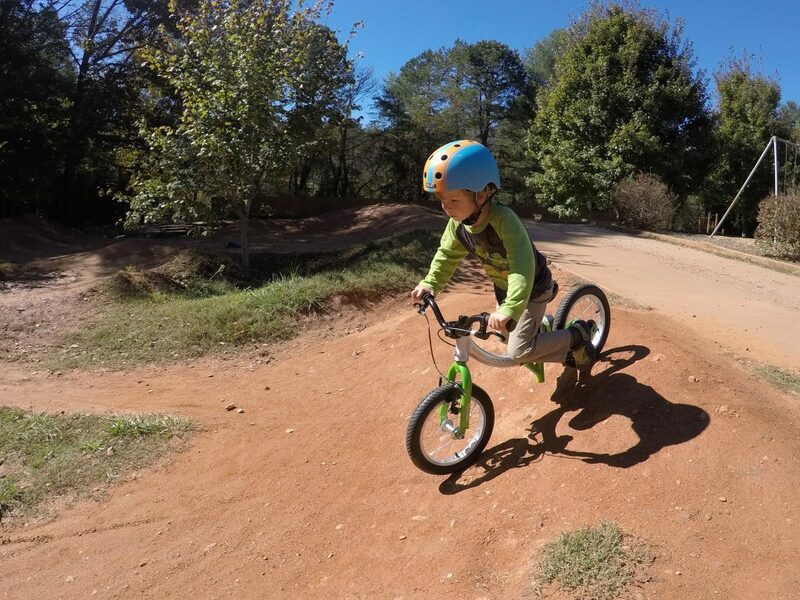 Whether in balance bike mode or pedal mode, kids will benefit from the beefy pneumatic tires, easy-to-operate dual hand brakes, and sealed bearings. The frame is made of lightweight 6061 aluminum, and even with the “flippable” design it proves to be durable and well-made. The fork is steel which ensures that it will withstand any abuse that an aggressive pre-schooler can throw at it. The LittleBig really shines as a balance bike, and has all the things we look for in a high-end toddler bike: dual handbrakes, pneumatic tires, and an aluminum frame. Although dual handbrakes aren’t a must-have on a balance bike, I certainly prefer them. They allow kids to begin working on braking skills at a young age (kids are usually capable around 2.5 years old), and for aggressive riders, brakes add an extra element of safety while saving the toes of your child’s shoes. We also love that the LittleBig bike offers pneumatic tires. Cheaper balance bikes often come with foam or plastic tires that are awesome for riding around the house, but don’t work so well in real-world conditions. 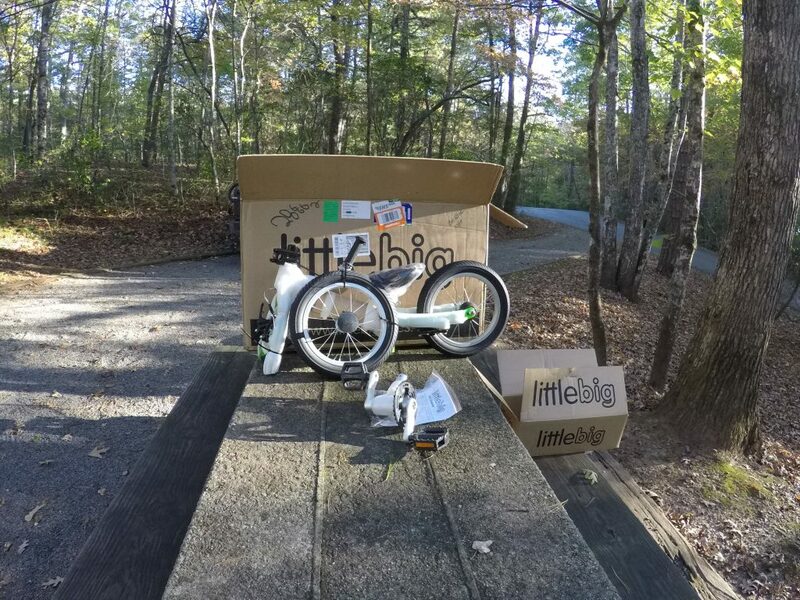 The LittleBig bike allows toddlers to begin adventuring beyond the living room, and the tires perform well on pavement, gravel, grass, and mud. With it’s 14″ wheels and a 14″ minimum seat height, this is a balance bike best suited for kids in AT LEAST a 2T pant, and will be more comfortable for pre-schoolers in a 3T or 4T pant. The weight (11.2 lbs) is a bit heavy compared to smaller balance bikes, but is easily handled by pre-schoolers. While the LittleBig balance bike is ideal for 3 and 4 year olds, if you are looking to introduce your 18 month old to a balance bike, they will be better suited by a 12″ balance bike like the Woom 1 with a low-standover and super low weight. 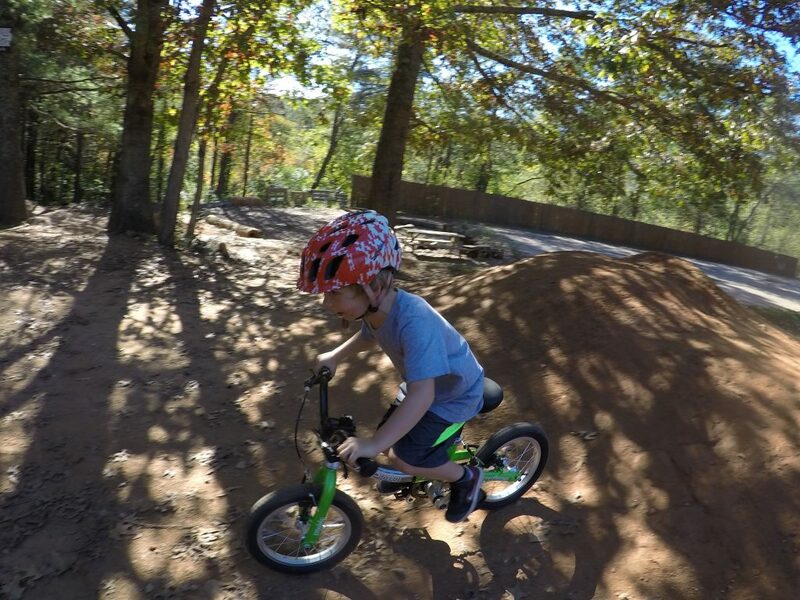 Once your kiddo has mastered balancing, coasting, and braking, it may be time to add pedals to the mix. Fortunately, for kids who are already comfortable on a balance bike, learning to pedal is usually easy and quick. (For help, read our article on teaching a child to ride a pedal bike). The LittleBig has 14″ wheels, and as a pedal bike, has a minimum seat height of 18.5.” As such, it will be most comfortable for kids in 4T pants or with an inseam height of about 18.” While LittleBig markets the bike as fitting kids up to age 7, I would caution parents against expecting the bike to last that long. If your child is just goofing around in the driveway, it might be okay–but by age 5 or 6 a child will be far better served by a 16″ or even a 20″ bike. The bike is sold only through LittleBig directly, and is shipped from Ireland worldwide. Shipping to the U.S. costs $30. We found that shipping was fast and efficient, and we had the bike in hand within a week. Not bad. There aren’t many bikes that are comparable to The LittleBig. In fact, it is only recently that it has had any competition at all. The Strider 14x is a newly introduced bicycle from the popular balance bike manufacturer that converts from balance bike to pedal bike. It lacks many of the nicer features of the LittleBig, however: no dual handbrakes and cheaper parts. The nicer components on the LittleBig do come at a price; with shipping, the LittleBig is more expensive than the 14x. 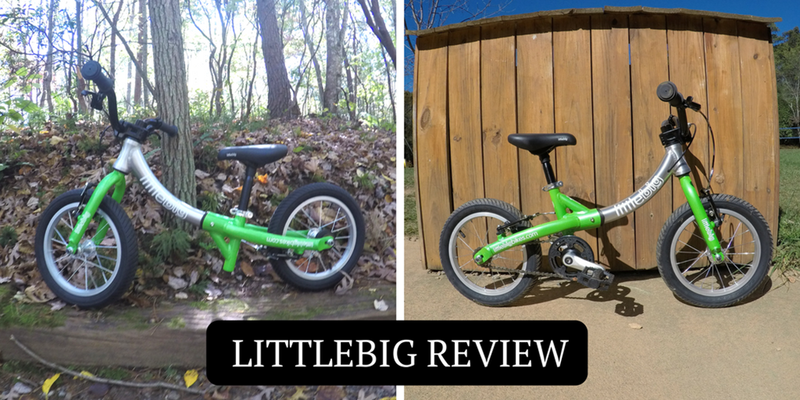 For pre-schoolers who are likely to begin pedaling soon, the LittleBig bike is a smart buy. It saves parents the hassle and expense of buying a balance bike only to have it traded out a few months later for a pedal bike. It also prevents the temptation of skipping a balance bike and resorting to training wheels instead. Thanks to high-quality components and a durable frame, the bike has a long useful life and the ability to withstand not one but two or more kids next in line. Hi, my daughter is a tall 18 month, going on 19 month old. We want to get her a balance bike and would love it if it would grow with her into a bicycle since a good balance bike can cost some money. Would you recommend the LittleBig? or do you think that she is too young for it? Thanks for your great reviews! Unless she’s exceptionally tall, I think the bike will still be too big for her. The best way to know is to get out your tape measure and measure her inseam. It needs to be AT LEAST 14″ for her to fit on the bike. The other reason I wouldn’t be to keen to recommend this bike for a child that young is that it is a little heavy for young toddlers. I would suggest buying a smaller, lighter bike for her at this point. She’s young enough she’ll get quite a bit of use out of it before you have to buy a pedal bike.